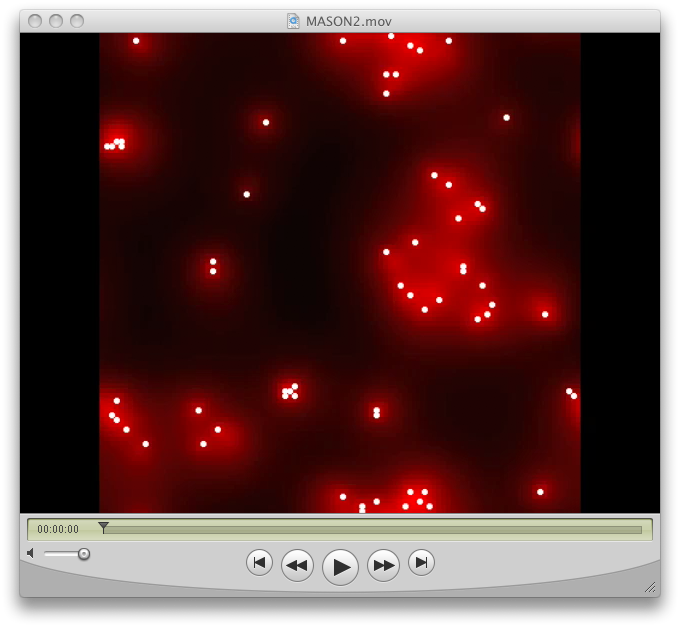 MASON relies on a Sun Java library called JMF (the Java Media Framework) to produce its movies. Unfortunately there are bugs in JMF which often result in a garbled format string which greatly confuses many media players (other than Apple's, it seems). These bugs will never be fixed (Sun has abandoned JMF), though we may try to work around it in the future. 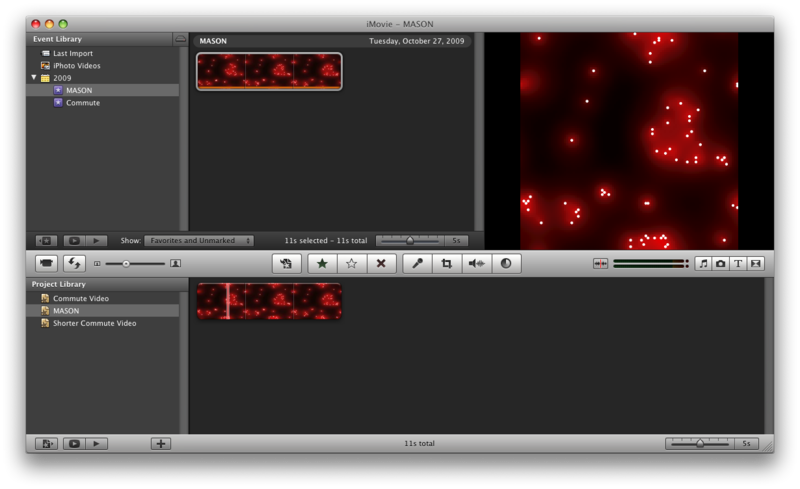 Furthermore, the JMF movies produced are gigantic because they're essentially uncompressed streams of images. If you have a Mac, it's easy to fix all this. 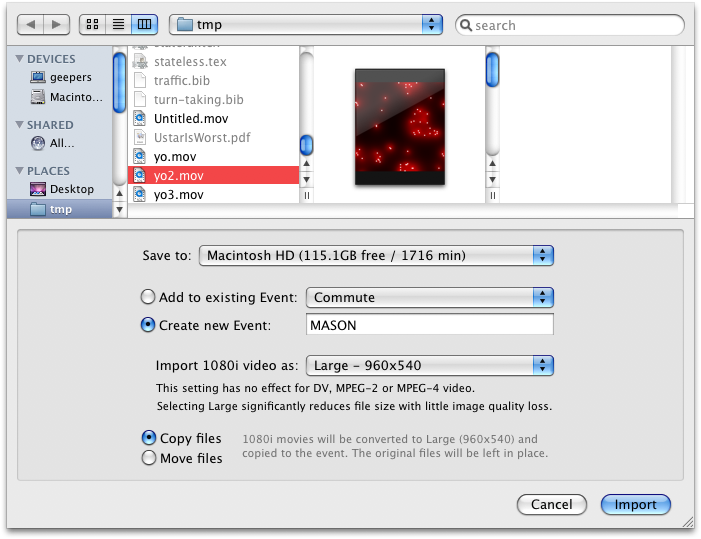 You can load the file in Quicktime Pro and reencode it out again as H.264. But in versions of OS X prior to Snow Leopard, Quicktime Pro costs $20. 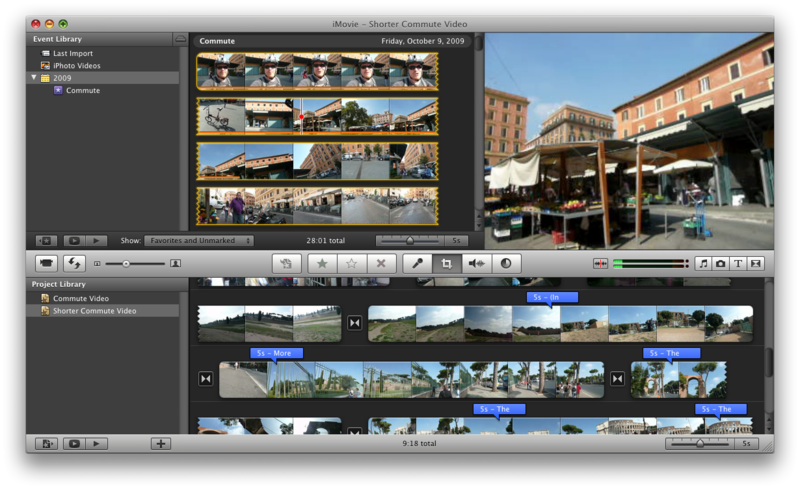 Here's how to do it in iMovie, a free program which comes with most Macs. When you create your movie in MASON, select a 16- or 24-bit format. Do not select a 32-bit format, which confuses iMovie for some reason. 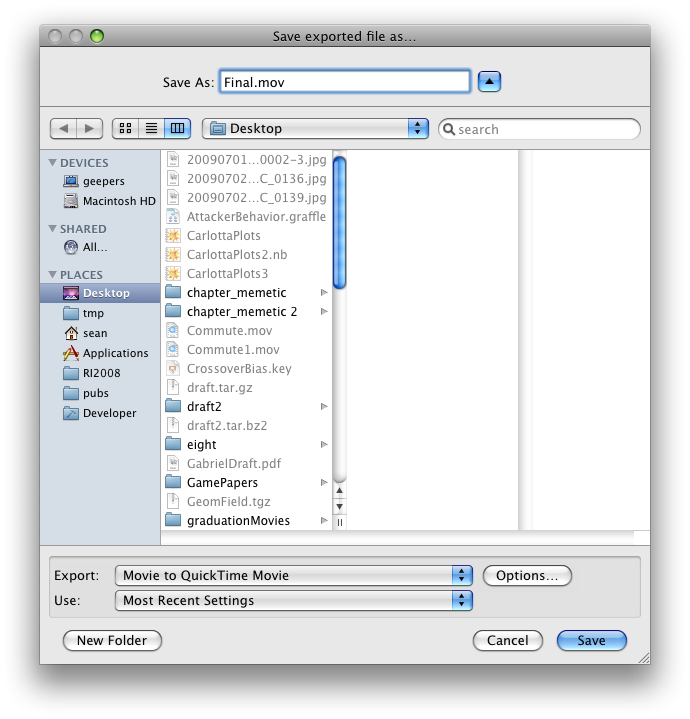 Here's the format options for JMF on OS X. Don't pick the third one. Choose a name for your project -- it really doesn't matter -- and an aspect ratio for your movie (we can modify that later, I suggest Standard (4:3)). The project will appear in the bottom-left corner of the screen. 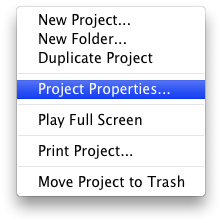 Right-click on the project and choose "Project Properties..." from the menu that pops up. You'll get the following drop-down panel. What you want to do is make sure that "Initial Video Placement" is set to "Fit in Frame". 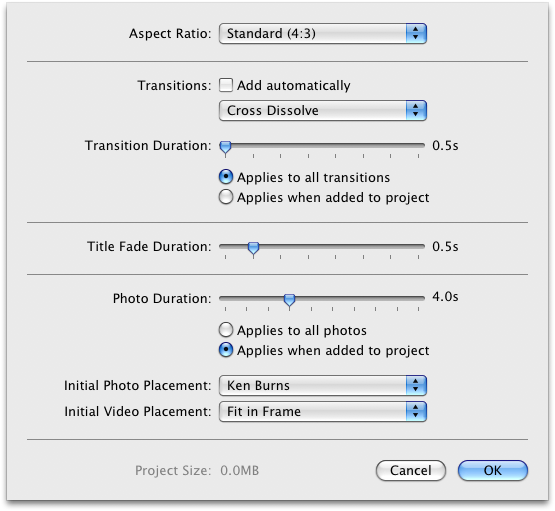 Otherwise iMovie will try to crop your carefully constructed MASON movie to put it into the 4:3 aspect ratio. Press OK. Under the "File" menu, choose "Import Movies...". You'll get the following open panel appear. You want to create a new event (I called it "MASON" here). Then select your movie and click "Import". 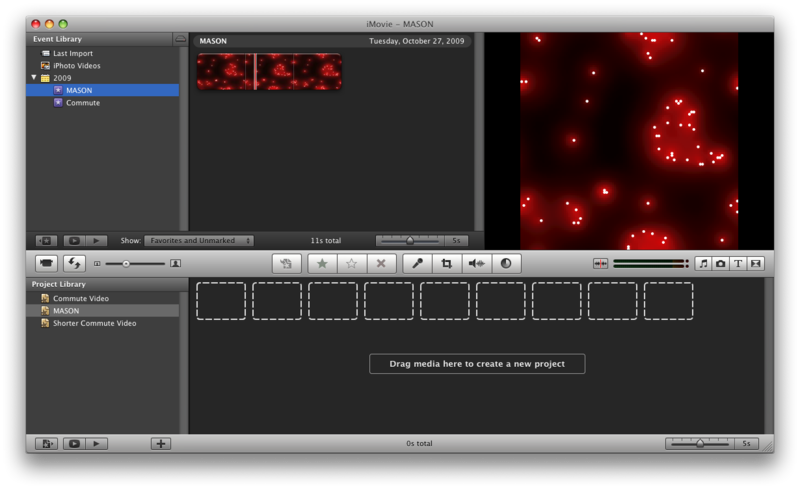 At this point you can add titles and cross-fades and other gizmos. But we're going to just export directly from here. Right-click on the project ("MASON") and the following pop-up menu appears. 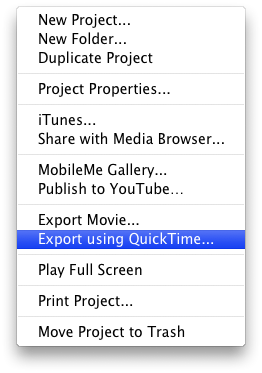 Select "Export Using Quicktime...". When the save panel appears below, click the "Options" button. The Movie Settings panel will pop up, like this. 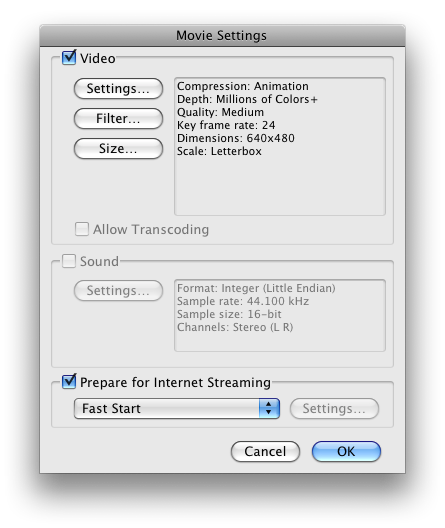 Click on "Settings" and change the Compression Type to "H.264" (that's my recommendation). The other settings are probably fine. Then click on the "Size" button. Here you have two options. If you want the movie to be fit into, say, 640x480, with letter-boxing on each side, then choose 640x480 and make sure "Preserve Aspect ration using:" is set to "LetterBox" (not Crop or Fit!). Alternatively if you know the aspect ratio of your previous movie -- for example many MASON models are square -- you can specify a custom dimensions for it. I've set the dimensions to 500x500 below. Either case, the movie has shrunk from about 51M to about 800K. Wow!